Tropical cyclones are considered some of the most powerful weather systems on the planet because of their size, strength, and potential loss to life and property. Tropical cyclones go by different names depending on geography; in North and Central America they are called hurricanes, in the northwestern portion of the Pacific Ocean near China and Japan they are called typhoons, and in the Indian Ocean and Australia they are named cyclones. They all have winds exceeding 74 mph, can be hundreds of miles wide, and tower over 40,000 feet above sea level. The following is a video and photographs from National Geographic on hurricanes. Describe the internal anatomy of a hurricane. 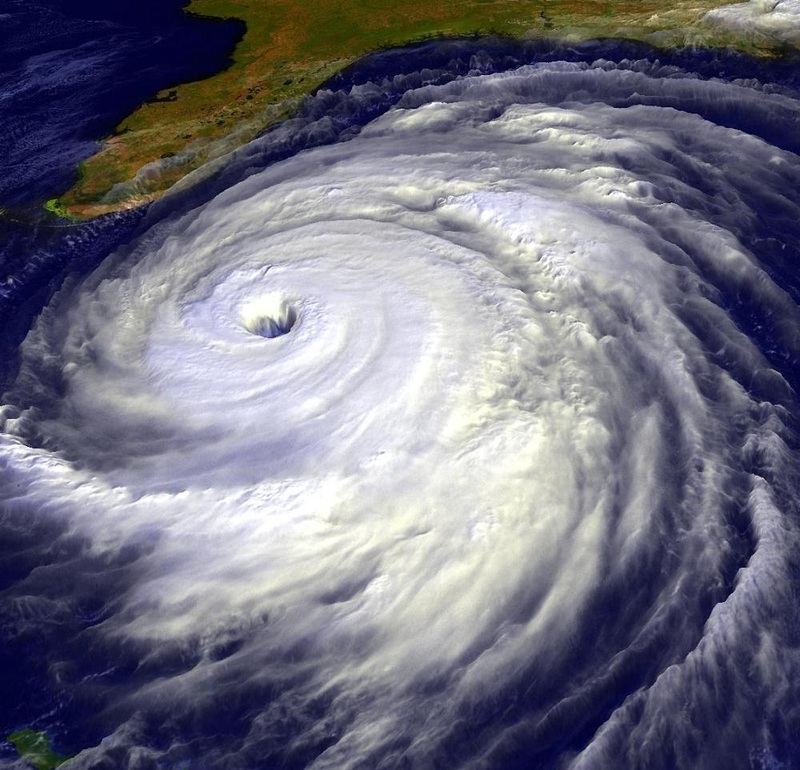 Analyze how modern technology is used by scientists to track and study hurricanes. There are several requirements needed for a hurricane to form. First, hurricanes must form over warm, moist oceans with surface temperatures that are at least 80 degrees Fahrenheit for at least 150 feet deep. This allows for water evaporate, causing the air to become warm and humid. The atmosphere must also be warm and humid so that latent heat energy could be released as the moisture condenses within a hurricane. The third ingredient is a low pressure disturbance, called an easterly wave or tropical wave, is needed for air to converge toward and ascend to produce powerful thunderstorms. Once these storms form, most need to be 5-20 degrees north or south of the equator to develop into a hurricane. If the tropical storm forms between 0-5 degrees north or south, the Coriolis effect is not strong enough to cause the storm to organize into a system and rotate. If the storm forms too far north or south, the water is too cold to develop into a hurricane. Finally, in order for a hurricane to form in the Atlantic Ocean, there must be little to no wind shear. If the jet stream is too low and blowing eastward while the trade winds are blowing westward, the wind shear will tear apart the forming cyclone before it can strengthen into a hurricane. In fact, most hurricanes form under large regions of high pressure within the Atlantic Ocean. Recall that high pressure tends to have clear skies and mild winds. Now there are five basic stages a hurricane goes through. The first stage goes back to the low pressure disturbance or easterly wave. Where easterly waves develop is currently being debated, but it is believe that they form either off the west coast of Africa near the Canary Islands or in eastern Africa near Ethiopia. At this stage warm, moist air begins to rise within the low pressure disturbance releasing vast amounts of latent heat, because of condensation, causing the storm to intensify. If the easterly wave forms under the right conditions, the Coriolis effect may allow the thunderstorms to organize and rotate and it becomes a tropical depression. If the tropical storm continues to organize and strengthen with sustained winds between 39-73 mph, the storm is upgraded to a tropical storm and given a name by the National Hurricane Center. If intense rotation continues, the storm grows with winds reaching 74 mph or greater, it becomes a hurricane. There are a variety of reasons why a hurricane will begin to die off. First it could move into colder water which does not supply the storm with as much latent heat energy. The idea is that colder water can not evaporate as easy and thus no latent heat is released. Another way is if the storm moves over land causing it to lose its source of moisture from below. Finally a third way a tropical storm could die off is if it moves into an area where winds aloft begin to tear the storm apart. An atmospheric event that can limit hurricane development occurs in the Pacific Ocean called El Nino. During an El Nino, the jet stream over the eastern United States migrates into lower latitudes. This upper wind shear caused by the jet stream moving eastward and the trade winds moving westward tends to tear apart hurricanes before they can form. Another phenomenon that can deduce or eliminate hurricane development are dust storms coming off the coast of the Sahara Desert and into the Atlantic Ocean. In the summer of 2006, following the record activity of 2005 with Hurricane Katrina, the Sahara Desert in Africa had several sandstorms coming off into the Atlantic Ocean. Now recall two things: hurricanes originate near Africa and the Atlantic Ocean must be over 80 degrees Fahrenheit for them to form. Well it is believed that the sandstorms blocked the sun over the eastern Atlantic, which ultimately cooled the ocean just enough to hinder hurricane genesis. The Saffir-Simpson Scale was created to determine the strength and intensity of hurricanes. Just like the Fujita scale, it ranges from 1-5 with category five being the strongest. The intensity of a hurricane increases as the atmospheric pressure near the eye decreases and the pressure-gradient force becomes steeper (atmospheric pressure decreases rapidly towards the eye), causing the winds to intensify, resulting in the potential for more damage. Storm surges, defined as a rise of ocean levels along a coastal area because of atmospheric low pressure within a tropical cyclone, are the most dangerous hazard created by a tropical cyclone. They are blamed for 90 percent of all deaths and property damage. The height of a storm surge is dependent on the strength of winds, which is dependent on the low pressure near the eye. The low pressure does not "pull up" ocean water to create a storm surge; instead the wind blowing towards the low pressure causes the water underneath to pile up near the hurricane's eye. As it approaches shore, the piling causes the sea level to rise and flood the area near the eye and eye wall. Storm surges are most damaging when the atmospheric pressure decrease, if the continental shelf rises slowly as it approaches shore, or if the storm surge arrives during high tide. The storm surge is also highest on the right side of the eye as winds blow toward shore in a counter-clockwise rotation. New Orleans was actually struck on the left side of the storm surge, so they did not receive the highest portion of the surge. Another hazard created by hurricanes is property damage caused by winds. Though property such as mobile homes is obvious, tall buildings are also susceptible to wind damage. People in tall buildings should get below the tenth floor because of powerful winds, but should stay above the main floor in case of flooding. Hurricanes also produce tornadoes. It is believed that hurricanes Charley, Frances, Gaston, and Ivan that struck Florida in 2004 produced nearly 300 tornadoes! Flooding, besides storm surges, are also a dangerous component of hurricanes. The 2004 hurricane season killed over 3,000. The majority of the deaths occurred in Haiti from flash floods and mudslides caused by the heavy precipitation. Category 5 Hurricane Mitch in 1998 killed over 18,000 people, most in Central America, dropping nearly three feet of rain causing massive flooding and mudslides. The governmental agency that analyzes and monitors hurricanes is NOAA's National Hurricane Center. Most hurricanes move westward as they approach North and Central America, then veer northeast. The reason is fairly simple. At around 30 degrees north, there is a subtropical high called the Bermuda High. As tropical storm systems move across the Atlantic Ocean, they are pushed westward from the underside of the subtropical high's clockwise rotation (a.k.a. the trade winds). As tropical storms move northward, the subtropical high's clockwise rotation (a.k.a. the westerly winds) push the storms northwestward into colder water. Nothing has helped advanced the understanding and analysis of hurricanes as much as meteorological satellites. The reason is obvious but important to note. Oceans are so vast that it is impossible to know where all the hurricanes (and potential hurricanes) are. Weather satellites allow scientists to see the development and structure of these tropical systems before they develop into hurricanes, along with their current conditions and their looming doom. Many of these include NOAA's GOES program and NASA's MODIS satellite system. 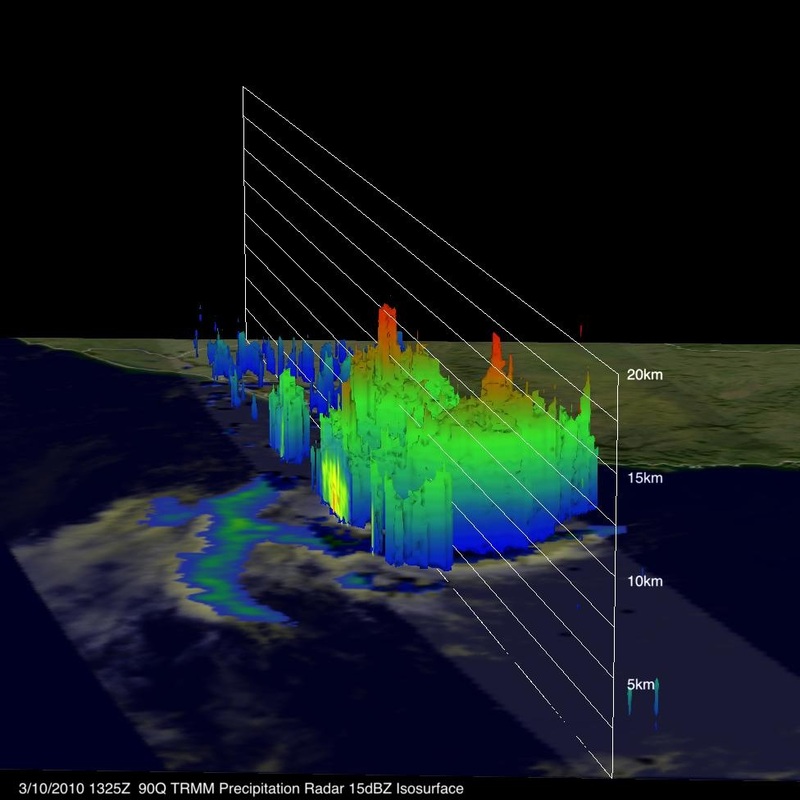 Until recently, satellites didn't have the technological ability to collect data and "see" within these systems; that was until NASA launched the Tropical Rainfall Monitoring Mission (TRMM), which allows scientists to "see" what is going on within hurricanes. Here's another short video from NASA. As a hurricane nears shore, scientists, called hurricane hunters, will fly specially equipped aircraft into the storm. The instruments within these aircraft give atmospheric scientist a better understanding of the inside of a hurricane. They also drop special instruments called dropsondes into the hurricane. Using a parachute, the dropsonde descends through the hurricane and collects atmospheric data such as temperature, pressure, winds, and humidity every half-second. On board Global Positioning Systems (GPS) instrument on the dropsonde gives scientists the location of the instruments as it falls through the hurricane. 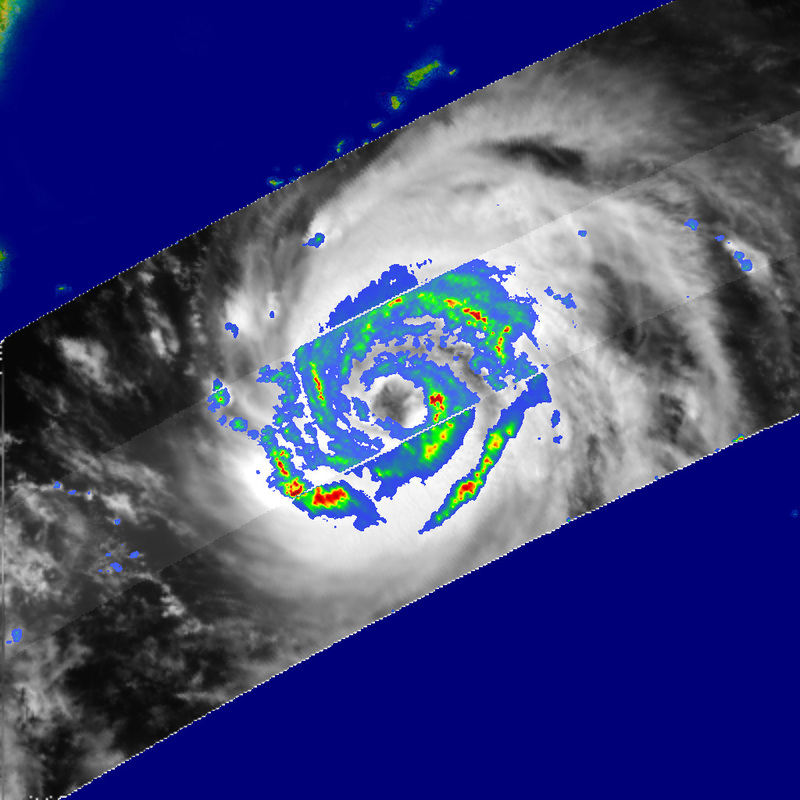 As the hurricane nears land, Doppler radar can scan the skies to collect directionally and intensity data about the approaching storm system including wind speeds and direction, rainfall intensity, and storm movement. This allows the NWS to give warnings of possible flooding, tornadoes, and/or possible wind damage. The problem with Doppler radar is that they are only good at collecting data 200 miles from the shore or closer. They can not be used to analyze atmospheric data in the deep open ocean where most hurricanes form. There are also several ocean buoys that float at fixed locations in the Atlantic Ocean and Gulf of Mexico. Ocean buoys transmit constant data of ocean conditions year round. Using data collected from satellites, aircraft, dropsondes, Doppler radar, and ocean buoys, the National Hurricane Center can issue hurricane watches and warnings. A hurricane watch is issued when a hurricane poses a threat to a particular area within 35 hours. A hurricane warning is issued hurricane force winds (74 mph) are expected for a specific region within 24 hours. There are two important factors that need to be determined before a hurricane watch or warning is issued. The watch or warning must used to first save lives followed by property. Second, the watches and warnings should not be overused. The threat must be immanent, or it becomes the "cry wolf" syndrome. Technology and information have greatly reduced the evacuation zone from a 1,000 mile radius to around 150 mile radius. There is no need to evacuate people who are safe. Before 1953, all hurricanes were named after the location they hit. An example is the Galveston Hurricane that struck Galveston, Texas in 1900. From 1953 to 1977, all hurricanes were named after females. Obviously this was very sexist. So in 1978, hurricanes were given male and female names alphabetically. Today, hurricane names are not just male or female; they are multicultural. The storm name before Katrina was Jose. After Katrina, the next storm was named Lee. If a storm causes enough damage, their names are "retired". There will never be an Atlantic hurricane named Hugo, Andrew, Mitch, Katrina, etc. Scientists have discovered that there are hurricane cycles that fluctuate between 30 years of increased hurricane activity followed by 30 years of less hurricane activity. Since the early 1990s, hurricanes have been in an active 30 year cycle. In that time, the United States has experienced monsters such as Hugo, Andrew, Isabel, Floyd, Katrina, Rita, and Ike. So we should expect to experience more hurricanes for another 10-15 years. Now add to the fact that over 50 million Americans live in hurricane prone regions, the experience of Hurricane Katrina may not be an isolated event. Click here for an animation from NASA about the 2005 Atlantic Hurricane Season. There’s been a lot of discussions between anthropogenic climate change and hurricanes lately. How can global warming cause hurricanes? Scientists believe anthropogenic climate change, also known commonly as global warming, is causing the planet to warm up. A warmer planet will mean a warmer ocean; this in term means more evaporation and more moisture in the atmosphere that can condense within a developing tropical cyclone, releasing the latent heat energy, and energize hurricanes. So ultimately, scientists do not believe that global warming will create more hurricanes, but that they may become more intense and creating more Category 4 and 5 storms. Hurricane Katrina was not the only hurricane that made the history books that year. 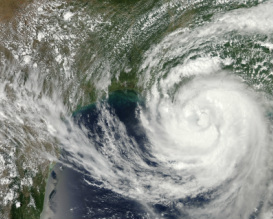 Hurricane Rita followed Katrina in September becoming the third category 5 hurricane that season and became the fourth most intense Atlantic hurricane in history. It just missed hitting Houston, Texas and instead hit the Texas-Louisiana border, but still caused $11.3 billion in damage and directly killed 7 people. In October 2005, Hurricane Wilma formed and became the most powerful hurricane in the Atlantic ever recorded. It struck land several times including the Yucatan Peninsula in Mexico, Cuba, and Florida. It is blamed for killing at least 63 people and costing $28.8 billion in damage making it the third costliest storm in United State history. Hurricane Katrina struck Florida and Louisiana in August of 2005. That was nearly a decade ago, so why is this catastrophic disaster still important to analyze today? Hurricane Katrina began as a tropical disturbance off the coast of Africa in August 2005. The disturbance began to develop and strengthened to a tropical depression, then a tropical storm, then into a Category 1 hurricane on August 23, 2005 off the coast of Florida. Hurricane Katrina quickly moved across Florida, killing a few people and entered into the Gulf of Mexico. For a few days, Hurricane Katrina stayed in the warm waters of the Gulf of Mexico where is strengthened into a Category 5 hurricane with 175 mph winds.By the time it hit New Orleans and Mississippi on August 29, 2005 it had weakened into a Category 3 hurricane. The following videos from National Geographic look at how Hurricane Katrina formed, and it's day-by-day progression to New Orleans. It is believed that 50,000 - 100,000 people stayed in New Orleans to "ride out the storm." Over 10,000 stayed in the Super Dome, home of the New Orleans NFL team, and another 10,000 stayed in the Convention Center. In the end, the storm killed at least 1,580 people and cost $230 billion in damage. At least one million people became homeless, and another five million were without power with a heat index of 105 degrees Fahrenheit.The storm took everything from everyone. Ten's of thousands were left without food, water, or shelter. At first, small scale looting began to occur because people needed supplies and the Federal Emergency Management Agency (FEMA) had not arrived. In fact, it took 5-7 days before FEMA arrived in some areas. A 72-hour kit was not long enough! But the looting became worse. People began to break into stores to steal clothing, shoes, iPods, and computers. Some even broke into stores to steal guns in order to break into other stores. The looting got so bad and dangerous that the mayor asked the National Guard to stop looking for survivors and stop the looters. if the storm was only a category 3 when it hit New Orleans, why did so many die? In order to understand why so many died, you need to understand why the levees were built. New Orleans was settled because it gave the settlers total control of the Mississippi River system. They controlled who could enter or leave the river system, which gave them political power and influence over much of the mid-western United States. The soil created by the Mississippi River flooding allowed for productive agriculture, but as the city grew land became scarce and people started building closer to the river. This required building the levee system to prevent the Mississippi River from flooding onto the growing civilization. But the levees created another problem; the city was no longer being built up by the sediment deposited from the seasonal floods and the area of New Orleans began to subside. So where did all the sediment go? The image above is a satellite image of the Mississippi Delta as it enters the Gulf of Mexico. Deltas are a natural phenomenon as rivers enter large bodies of water, but the Mississippi Delta is much larger than it should be. Today, New Orleans ranges from 4 - 12 feet below sea level. Meteorological records dating back to the 1700s show that a major hurricane has hit the area every 50 years. The last major hurricane was Hurricane Camille in 1965. By the time Hurricane Katrina hit, many of the levees in New Orleans were either too old or built poorly. For a long time, scientists and engineers had warned that the levees would only withstand a category 3 hurricane and accompanying storm surge. In fact, the year before Hurricane Katrina, New Orleans had completed a mock scenario of what would happen if a category 5 hurricane hit the area directly. There are several reasons why the levees broke. Some of them broke because the re-bar holding the walls up were too small or weak for the surge of water coming through, and the levees collapsed. Others fell because the 15-25 foot storm surge over topped the levees. As the water rushed over the levees, the water eroded the loose sediment at the base causing the levees to fall over. 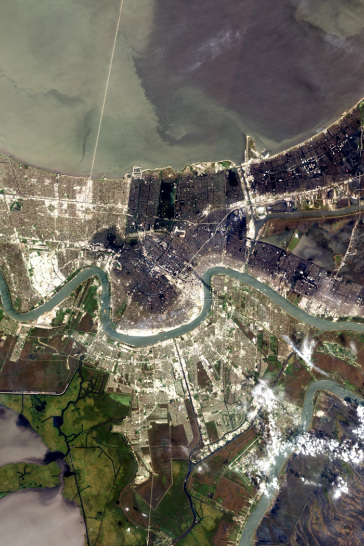 The satellite image on the right from NASA shows where the levees broke and engulfed the city. The third way was that the pressure within the levees was so high that the water actually pushed the walls away. See the image on the right from the U.S. Army Corp of Engineers. One common occurrence with all the levee failures were the levees would break on one side and hold on the other. This would cause property on one side to by flooded - up to 20 feet high of water - while leaving the other side completely dry. When the levees broke, 80 percent of New Orleans was under water with some areas as high as 20 feet. It became an environmental catastrophe because the city became a stagnant lake of debris, chemical spills, sewage, and dead bodies. Many were concerned for the health of the rescue workers because of the toxicity of the water. The image below from NASA shows the scale of the flooding caused by the storm surge coming up the Mississippi River and Katrina's eye "picking up" a portion of Lake Pontchartrain and dumping it on the backside of New Orleans. Not only were there concerns about the water quality immediately after the disaster, but there was also concerns about the long term health of the regions ecological systems. The concerns centered on what affect the toxic water had on marine organisms such as the flora (plants) and fauna (animals), along with the health of the wetlands. Of great concern following the disaster were the wetlands. For a long time in United States history, our country looked at wetlands as "wastelands". Yet the biodiversity within wetlands are vast and full with life. The Environmental Protection Agency (EPA) states that wetlands are like "nurseries of life" supporting an enormous variety of aquatic and terrestrial plants and animals. There are also other benefits to wetlands: they filter and clean our rivers, lakes, and estuaries and also weaken the strength of storm surges. Because society is now realizing the importance of wetlands to biological diversity, water quality, and storm surge protection, there is a movement to protect the remaining wetlands in the nation. Currently, the United States is losing 60,000 acres of wetlands a year. After Hurricane Katrina, NOAA and the Louisiana Department of Natural Resources developed the Coastal Wetlands Planning, Protection, & Restoration Act to develop, and restore vast areas of Louisiana's coastal wetlands for future storm surge protection. So the question is still, "why did so many stay behind"? Part of the problem was the "cry wolf" syndrome. For decades, New Orleans has been told that if a hurricane struck the area the city would drown. Many documentaries on hurricanes discuss that New Orleans would be the worse case scenario. But for the last fifty years, whenever a hurricane came near and people were told to evacuate, the storm would always veer off missing the city. So after a while, people decided that the odds of getting struck by a hurricane were small. But that is only part of the story. Following the disaster of Hurricane Katrina, many social scientists examined the demographics and social implications caused by the hurricane. What they discovered was that the majority of those affected were either low income, minority, the young and elder, and/or the sick. The demographics is simple, nearly 27 percent of New Orleans lives in poverty. Poverty is a state in which a family’s income is too low to be able to buy the quantities of food, shelter, and clothing that are deemed necessary. In the United States, more people live in poverty than in any other industrialized nation in the world. Bringing it home to Utah, the Utah Food Bank is one of the highest used food banks in the country. There are numerous reasons why poverty occurs: some say the economic system favors the rich; others say low income individuals lack the ability to get job training in an ever changing world economy; many say that the jobs low income workers currently have are moving overseas because of globalization. Can you think of any others? All of these are true to some level along with many others. But that is for a social science class to discuss. The affects are that many of those living in poverty live in densely populated areas where middle and upper class Americans do not want to live. The Ninth Ward of New Orleans was one of the areas most affected by the disaster. The poverty rate in the Ninth Ward was 36.4 percent. One quarter of the people made less than $10,000 and less than half the population made $20,000. The community was near a levee and about four feet below sea level before the storm; after the storm the levees broke and the area was flooded with 20 feet of water. Many here could not leave because they lacked transportation. Others could not leave because they had nowhere to go. You must ask yourself the question, "If I only made $10,000 a year, where would I go if I had to evacuate?" You can't afford a car, a hotel, and maybe you don't have family to go to. So where do you go? To see more images of the Ninth Ward following Hurricane Katrina, click here.